While most visiting anglers from other countries are only familiar with British Columbia's salmon fishing, this province's trout fishing in lakes can be considered as world class and is probably our best kept secret! The high quality of trout fishing in lakes is only possible thanks to the Freshwater Fisheries Society of BC, which is responsible for operating five trout hatcheries and stocking hundreds of lakes in this province. Rainbow trout are native in British Columbia. Although natural populations can be found in some lakes where they are interconnected with larger drainage systems via their tributaries, many lakes in fact do not have fish in them originally. This province's trout stocking program, funded by your freshwater fishing licence, has created fishing opportunities at these empty lakes. The type of trout stocked at each lake depends on the biology of the lake. Biologists analyze the food availability, water temperature, oxygen level and general health before determining what and how many should be stocked in a lake. Urban lakes, or lakes that are close to the city, are stocked with rainbow trout at what is known as "catchable sizes". These trout are raised to around 300 grams before being released so they can be caught and enjoyed immediately by anglers. Urban lakes often experience high fishing pressure, so ongoing stockings throughout spring and fall are done to meet this demand. Most urban lakes have low food availability so stocked trout often do not grow much bigger than their release size. It is a fishery designed for entry-level anglers, families and those who wish to do some fishing without having to travel very far. In Region One (Vancouver Island) and Region Two (Lower Mainland and Fraser Valley), there are dozens of urban lakes which you can visit. Fishing at these lakes can be done year round, but the best time is spring and fall when water temperature is ideal and stockings are done. It is a convenient fishery where parents can bring their kids to, cast out a bobber and worm, and expect to catch at least a few trout during each outing. Region Three (Thompson-Nicola), Region Five (Cariboo) and Region Eight (Okanagan) are a paradise for anglers who enjoy catching trout. Beside natural populations of aggressive rainbow trout, hundreds of lakes are stocked with trout that can weigh up to 10lb! Hatcheries release trout into these interior lakes at the fingerling stage (~10g). Due to high (insect) productivity at these lakes, stocked trout are able to reach 2 to 5lb after spending one year in them and continue to grow if not harvested by anglers. These trout are exceptionally strong because they are well fed and healthy. In the winter time, they can be caught by ice fishing. Ice fishing is a very social activity, which brings families and friends together. While the catching is fun, it is not always about the fishing, but about the food, gathering and good times. Between spring and fall, trout enthusiasts head to their favourite lakes in search of the biggest trout in their lifetime. Fly fishermen match the hatch and can often outfish anyone else. If fish are feeding on the surface, dry flies are used. If chironomids are emerging from the lake bottom, then fishing with a indicator and a suspended wet fly is preferred. 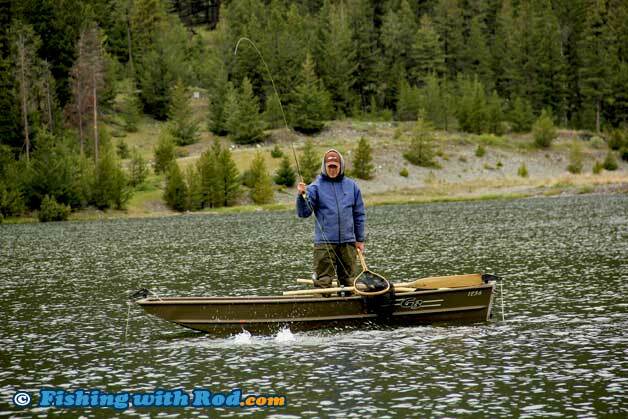 Trolling on a boat is also productive for those who do not fly fish. Depending on how far the lake is from your residence, a day trip is usually not possible for this fishery. The best approach is to spend a couple of nights by combining camping by the lake. While some lakes can be quite remote and difficult to get to, many lakes are located in provincial parks where camp sites are available. A boat is often needed when fishing at interior lakes, but designated family fishing lakes have docks set up so you can fish from them. British Columbia does not have a shortage of large lakes. Kootenay Lake, Okanagan Lake, Skaha Lake are just some which holiday goers are familiar with. These lakes are deep and their residents are the infamous Gerrard rainbow trout and bull trout. These two predatory species, feed on small fish such as kokanee, so they can grow to a tremendous size. Fish in the 10lb and 20lb classes are not unheard of. Fishing for them usually requires a larger boat, where you troll plugs and spoons as if you are fishing for salmon in the ocean. Rainbow trout come in many strains. A strain is also known as a variety. Wild rainbow trout found in different rivers are not similar to each other because they have adapted to the environment where they have inhabited in over many generations. Each river produces an unique variety, or strain, which is only successful under certain conditions. In British Columbia, several strains of rainbow trout are cultured at the hatcheries so the appropriate strain is stocked in suitable lakes. 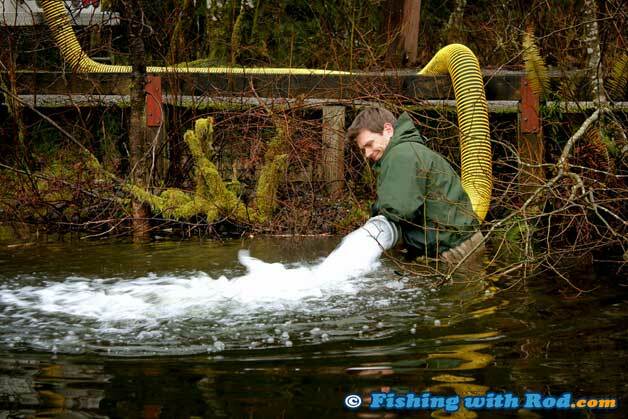 Fraser Valley rainbow trout are raised and stocked in urban lakes due to their fast growth rate. They are also stocked in lakes that have experienced winter or summer kills so the fishery can be revived within one year. A Fraser Valley rainbow trout, released at 300g in a highly productive lake, can reach 5lb within one year since its release. They are usually heavily spotted and rarely jump when being caught. 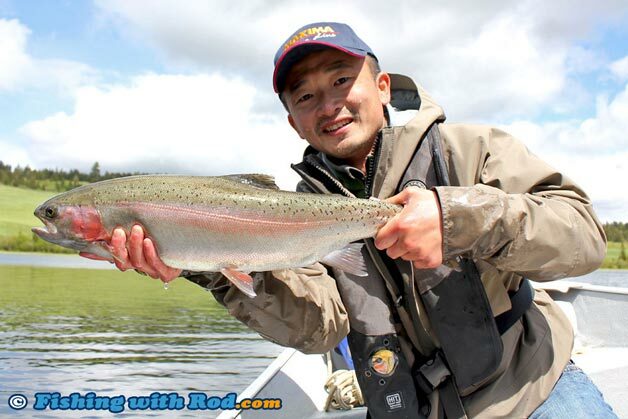 In most fisheries where Fraser Valley rainbow trout are present, they can be caught by almost any fishing method because they seldom discriminate when feeding. Blackwater rainbow trout are mainly stocked into lakes where other fish species such as minnow are present due to their survival success under this competition for food and space. Their long, streamlined body has a heavily spotted back and tail. Their fight can be powerful, mixed with the odd jumps. While flies that imitate insects work great for Blackwater rainbow trout, they also will strike a lure at times. 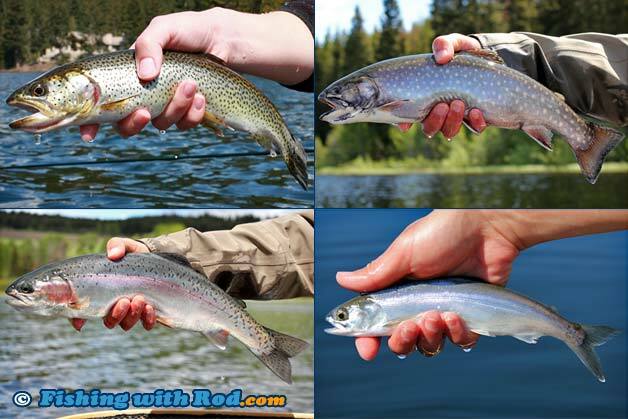 Pennask rainbow trout are by far the favourite strain for most lake fly fishermen. Their fight is spectacular due to their multiple jumps and long powerful runs. Their body has very few spots compared to the other strains. Although catching them can be very enjoyable, luring them to bite can be a frustrating process at times. Their diet is primarily made up of insects, so finding the correct fly to match the hatch is extremely important if you wish to be successful. Beside rainbow trout, anglers in British Columbia also have the opportunities to target cutthroat trout, kokanee and brook trout. Natural populations of cutthroat trout are usually found in lakes which drain into coastal streams. They are also stocked in some lakes along the coastal region. Kokanee are landlocked sockeye salmon. Self-sustaining populations of kokanee are found in some lakes in Region Two, Three and Eight. They are also stocked yearly in some larger lakes. Brook trout, or Eastern brook trout, are not native in British Columbia. Stocked populations are mainly found in Region Three and Four. If you have never tried lake fishing in British Columbia, then the best thing to do is to give one of the urban lakes a try. To maximize success, you should also check the catchable rainbow trout stocking database so you can time your outings around when fish are being released. Once you have become familiar with catching trout at urban lakes, then it is time to travel a little further and experience some world class trout fishing. Visiting a new lake can be intimidating, so you should do as much research as possible prior to your trip. Ask your local tackle store about the lures and flies that you should have at a particular lake. It also does not hurt to ask how the fishing has been. Try choosing a lake where a resort is available. More often than not, the owner or caretaker of the resort is an avid angler and can help you out if it is your first time. If you plan to fish from a boat, then you should make sure that you have all the required safety equipment and your boating card. Safety should be your number one concern. A depth sounder is very useful for determining where the shoals and drop-offs are, which is quite important for finding feeding fish. If you plan to anchor, then be sure to have a double anchor system. An anchor at the front and one at the back of the boat prevent you from spinning when the lake is windy. Good luck, stay safe and enjoy exploring all the fantastic lake fishing opportunities in British Columbia!